To celebrate the opening of Saturated: The Allure and Science of Color (May 11, 2018-January 13, 2019), Object of the Day this month will feature colorful objects from the exhibition. This post was originally published October 17, 2015. Richard Landis received formal training in art and design, but was essentially self-taught as a weaver. 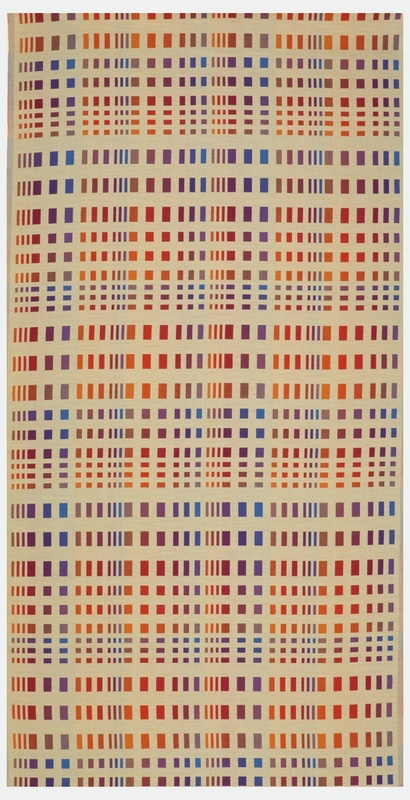 He believed hand weaving, in particular the double cloth structure, offered him the exacting control he sought in the exploration of form and color, and he worked almost exclusively in that format to create systematic compositions of modular elements of color and geometric forms. Nucleus, also in the museum’s collection, is a superb example of Landis’s technically and aesthetically disciplined hand woven double cloth. Maleyne M. Syracuse is President of the Board of Directors of Peters Valley School of Craft, a former Treasurer of the Textile Society of America, and an independent art historian. She is a graduate of the Masters program in the History of Decorative Arts at Cooper Hewitt, Smithsonian Design Museum/Parsons The New School for Design.